Every man has a right to his opinion, but no man has a right to be wrong in his facts. Note: Italics identify quotes from the book; for my own emphases, I use underlining here. Despite his pompous claim to teach all of us how to think critically, McAdams offers not a single reference to standard works on logical fallacies. Nor does he ever present his unique credentials for this task. After all, why would a professor of “American politics, public opinion, and voter behavior” automatically possess such superior skills in critical thinking? On the contrary, in this rather narrow-minded book, he demonstrates all three of these political disciplines. In order to persuade the reader to vote for his dubious conclusions, he uses the standard tools of manipulation and commits a variety of crimes against logic—the straw man, the invalid analogy, begging the question, special pleading, the false dichotomy, and the moving goalpost. Numerous examples of these fallacies are presented below. Fortunately, although his online persona is sometimes less than admirable, here he does not often resort to ad hominem attacks. Everybody knows that writers, newscasters, and producers of documentaries can mislead their audiences by leaving out certain information. The reader of this book may be dismayed to discover how often these omissions happen. To actually solve a crime, you have to throw away most of your pieces of “evidence.” You have to conclude that this sighting of the suspect where he could not have been is bogus, that the crackpot witness is not to be believed, and that a juicy-looking “connection” actually leads nowhere. When you do that, you are left with reasonably hard and reliable evidence, and with some luck, you can break the case. If you refuse to cull your evidence, you end up with suspicions out the ears, and no solution to the crime. McAdams cites no textbook on evidence for this method—nor does he provide a general framework for such culling. In fact, he violates a fundamental principle of scientific reasoning: the requirement of total evidence, which insists that conclusions must be based upon all the relevant evidence. On the contrary, McAdams’s goal seems extraordinary: he strives for a conclusion at all costs, even if it is the wrong one. This is a sensible statement, but McAdams prefers outliers that do not threaten his case. Unfortunately, as occurs too often, he makes these selections behind the scenes. This means that his reader is actively blind folded, i.e., he is stripped of the opportunity to decide for himself what evidence is authentic.
. . . it is better to describe 10 findings that might prove to be of no significance than to omit one that might be critical. The purpose of a protocol is twofold. One is to record a sufficiently detailed, factual, and noninterpretive [emphasis added] description of the observed conditions, in order that a competent reader may form his own [emphasis added] opinions in regard to the significance of the changes described. Thus, a region of dark blue discoloration in the… may or may not be a bruise. To refer to it as a contusion in the descriptive part of the protocol is to substitute an interpretation for a description, and this is as unwarranted as it may be misleading…. Dr. Moritz was a member of the Clark Panel (1968), which reviewed the JFK evidence. As Cranor observed, Moritz and his panel violated this principle when, based on their examination of poor quality photographs taken from a distance, they pronounced JFK’s throat wound as “characteristic of that of the exit wound of a bullet” (Clark Panel Report, p. 9). On the contrary, because it was a small, round wound, it was in fact typical of an entrance wound. As Cranor notes, they gave no description of its appearance, and gave instead "an interpretation for a description.” For decades now, defenders of the lone assassin theory have fine tuned such skills of misdirection, and John McAdams here similarly proves to be an apt student of this technique. If one theme can be extracted from this book it is this: Do not trust eyewitnesses—except for those approved by McAdams. It is widely understood that eyewitnesses are not very reliable in recalling complex matters, including recognition of faces, especially if these are only briefly glimpsed. In addition, intricate sequences of events (especially with multiple actors) are challenging for eyewitnesses. Nowhere, however, does McAdams cite one of his own authorities (Elizabeth Loftus) for those contrary occasions when eyewitness testimony has been shown to be highly reliable. In fact, when recall is prompt, and items are salient and simple, eyewitnesses do remarkably well. See Appendix 2 for further details. McAdams accuses conspiracy partisans of carefully selecting eyewitnesses to make their case. Paradoxically, however, although McAdams (p. 2) emphasizes that the Dealey Plaza witnesses are central, he does not have the courage to discuss the ten Plaza witnesses who were closest to the limousine that day, many of whom were ignored by the Warren Commission (WC). These witnesses are clearly not randomly selected (p. 28), yet they uniformly (and promptly) recalled a simple and salient event that day: they said that the limousine stopped (or nearly stopped). This is relevant to understanding the assassination and cover-up because the Zapruder film does not show such a stop. (Historically, this was the initial reason for suspecting that the film itself had been altered.) For a compilation of these witnesses, with citations for their comments, see Murder in Dealey Plaza (MIDP, pp. 341-342). Since these witnesses disagree with the Zapruder film, which McAdams takes to be “hard” evidence, perhaps he has merely chosen to cull them—but then he has done so without telling us. On the other hand, when multiple witnesses describe Tippit’s murderer as manually ejecting spent cartridges from his weapon (p. 177), McAdams has no trouble believing these witnesses (who of course support his case). As expected, after reviewing the ballistic evidence in this murder he concludes that Oswald did it. However, Don Thomas reviews this same evidence (Hear No Evil, Chapter 14) and reminds us that three separate sets of experts have arrived at “three irreconcilably different opinions….” McAdams, of course, reports none of this, so he is guilty here of a methodological inconsistency (often called “a double standard”), which of course merely impugns his credibility. Furthermore, although McAdams claims that the Zapruder film shows no occipital wound, this issue is at least controversial. Recent work by Hollywood professionals has shown a distinct black, geometric-shaped mask lying precisely over the occipital area in question (on multiple frames in a film approved by the National Archives). This apparent artifact is highly suggestive of photo tampering. I have observed this geometric mask myself in Hollywood, and have confirmed the same feature on the MPI images at the Sixth Floor Museum in Dallas (while accompanied by one of the Hollywood personnel). Surely, at the very least, McAdams must view these MPI images before he draws conclusions—after all, these images are accessible to the public. Even if history is replete with false sightings of individuals, especially famous miscreants (e.g., Malcolm Naden and John Wilkes Booth), as McAdams maintains, then that information can tell us very little about the two-Oswald hypothesis—instead, each case must be decided on its own merits. After all, some sightings are not false (e.g., John Wilkes Booth was probably photographed at Lincoln’s second inauguration—see here). Determining the accuracy of such sightings is analogous to deciding what past events have been authentic conspiracies. As McAdams himself admits, for such a decision a case-by case approach is essential (p. ix). Ironically, McAdams himself—a self-anointed instructor in logic—falls prey here to another logical fallacy: the appeal to probability, i.e., just because something could have happened (mistaken sightings in this case), it is inevitable that it did happen. Although McAdams accepts 9/11 as a real conspiracy (pp. ix and 201), he still maintains that “conspiracy theories” see the government as “very evil but very competent.” Paradoxically, though, sometimes the government itself reports a conspiracy (e.g., 9/11 and the Lincoln assassination), so we can ask: Does that imply to McAdams that conspiracists also view these (government) reports as evil, but nonetheless competent? (Surely, doubters of The 9/11 Commission Report would not agree with this.) This is the kind of logical absurdity that follows from (possibly subconsciously) considering all conspiracy theories to be false. Another point should be made. Because false sightings do occur, and because humans are quite poor at recalling briefly encountered faces, we ought therefore to conclude that, rather than discrediting the two-Oswald hypothesis, this human flaw lends some support (unintentionally and indirectly) to the two-Oswald scenario. Why should that be true? Consider this: If two Oswalds existed, then eyewitnesses could not reliably distinguish between them. For example (since we cannot trust eyewitnesses) even if the same witness had seen two different Oswalds on two different occasions, that would not be sufficient proof of two Oswalds. Therefore, since we cannot fully trust eyewitnesses on this matter, the question of two Oswalds is actually left open by the eyewitnesses—it must instead be decided by objective evidence, such as documents and photos. When McAdams discusses the two-Oswald scenario, he dodges the more recent 983-page opus by John Armstrong (Harvey and Lee--$325 on Amazon) and instead cites (p. 42) the 1966 book by Richard Popkin (The Second Oswald). Armstrong does not even appear in McAdams’s index. On the contrary, readers might, for example, like to view the strange newspaper photo of “Oswald” at the time of his defection. (See: note image 13 of 50, second row, third photo.) And surely the man photographed in Mexico City as “Oswald” was not Oswald. Even J. Edgar Hoover conceded that the “Oswald” voice on the tape was not Oswald. This omission of Harvey and Lee exemplifies the logical fallacy of special pleading, i.e., citing only evidence favorable to one’s case, while suppressing the rest. The Acknowledgments cite no fact checker, a singular omission, especially in view of the high risk for errors that any JFK author inevitably faces. As we shall soon see (items 1-6 below), this is a grievous mistake. Although three editors at Potomac are listed, a copy editor would also have been wise, e.g., McAdams lists Zapruder, Nix, and Muchmore as shooters in Dealey Plaza (p. 180)! Another blooper occurs when he comments (p. 27) on David Lifton’s theory: “But if you ignore the weight of the evidence, it’s likely to be an absurd theory.” Of course, he meant “accept,” not “ignore.” An amusing mistake occurs in the timeline (p. 259): “Oswald arrested…after attempting to shoot…McDonald…and scuffing with police.” (Scuffing is defined as walking without lifting the feet.) The long list of those thanked (second paragraph in this section) invites skepticism—almost all would be described as anti-conspiracy; in other words, McAdams has plainly, and without apparent embarrassment, skewed his case from the outset. McAdams claims that, because individuals cannot keep a secret, a large conspiracy is impossible (p. 248) and for this he offers an unintentionally comical statistical “proof.” One of his scenarios assumes 20 conspirators, ironically just one more than that cited by the official 9/11 report. From this he predicts a 95.5% probability that the secret (of the conspirators) would get out. However, we all know that, in the case of 9/11, the secret (of flying into structures) did not get out. In a similar vein, I have previously cited multiple powerful examples in which many individuals actually did keep deep and important secrets (see Appendix 4). McAdams then heroically wades into a statistical morass—by introducing his supposed analogy of false positives in medicine (p. 192). He conjures up a test for leukemia (for 61 subjects) in which 11 or 12 false positives are to be expected. (Although he states that leukemia is rare, my own father died from it.) He claims, without any statistical analysis, that if 15 subjects actually test positive then we can conclude that no one has leukemia and that everyone should relax. Of course, he has omitted the critical piece of information—the standard deviation for this test, which means that we cannot assess his conclusion. (Readers interested in a serious discussion of these issues should consult a superb book by H. Gilbert Welch: Should I be Tested for Cancer? Even worse, though, his analogy to the 15 matches in the acoustic data is a false analogy (see discussion below). He implies that Jim Sibert and Francis O’Neill were the only witnesses who heard Humes describe prior surgery to the head. This is false, however, as I have previously emphasized, because James Jenkins is another (High Treason 2 by Harrison Livingstone, p. 234; also see In the Eye of History by William Law, p. 80). Jenkins repeated this statement to a small group (which included me) in Fort Myers, Florida in September 2002. Furthermore, Doug Horne summarizes how Tom Robinson and Ed Reed recalled how James Humes, the pathologist, may have performed cranial surgery before the official autopsy began (Inside the ARRB, Volume IV, pp. 1005 and 1167-1169). As I took the position at the head of the table…I was in such a position that I could very closely examine the head wound, and I noted that the right posterior portion of the skull had been blasted. It had been shattered, apparently, by the force of the shot so that the parietal bone was protruded up through the scalp and seemed to be fractured almost along its posterior half, as well as some of the occipital bone being fractured in its lateral half, and this sprung open the bones that I mentioned in such a way that you could actually look down into the skull cavity itself, and see that probably a third or so, at least, of the brain tissue, posterior cerebral tissue and some of the cerebellar tissue had been blasted out. McAdams promotes the idea (p. 229) that the oval shape of Connally’s back wound proves that it was caused by a yawing bullet–the result of first striking another object (which he supposes was JFK’s neck.) McAdams cites 7HSCA144 (Volume 7, page 144 of the House Select Committee on Assassinations), but that page raises an alternate explanation for an elongated wound: a tangential strike. (McAdams wonders whether a “sharp” angle might explain the wound, but it is not clear whether McAdams means tangential. )Michael Baden, one of McAdams’s favorite sources, has gone to great lengths to “prove” that Connally’s back was not only struck by a yawing bullet, but by one that struck sideways (with the full length of the bullet), thus creating a 3 cm long wound. However, Milicent Cranor buried this myth in her decisive essay: “The Trajectory of a Lie” (http://www.history-matters.com/essays/jfkmed/BigLieSmallWound/BigLieSmallWound.htm). Baden’s mistaken belief had originated with John Lattimer, M.D. In an article published in 1974, Lattimer used the operative report as evidence: it described the size of the wound during surgery, after it had been cleaned and enlarged (as by a scalpel) to 3 cm. But the pre-operative back wound, i.e., the size created by the bullet, was only 1.5 x 0.8 cm. Cranor notes that the actual size of Connally’s back wound was almost the very same size as the entrance wound in JFK’s head: 1.5 x 0.6 cm. She delights in observing that no one has ever said that JFK’s head was hit by a yawing bullet. McAdams seems oblivious to the facts in Cranor’s analysis, which includes thorough documentation for these measurements. Even Bugliosi refrained from promoting this myth of a 3 cm back wound, reportedly because of Cranor’s article, although he does not cite it. McAdams claims that no bullet fragments are seen on the left side of JFK’s AP X-ray. (That is JFK’s left—the side of lesser trauma—which would be the reader’s right side.) But this is manifestly false, as I have repeatedly emphasized over many years (see Appendix 5, Figure 1). How do I know that this object is metallic? First, it is also visible on both lateral X-rays; that an artifact would be so spatially consistent—on three X-rays—is quite unlikely. Second, at the National Archives, it does look like metal: its borders are sharp while its optical density and shape are also consistent with metal (compared to the other metallic fragments). Third, the relative densities on the three X-ray views are all consistent with one another. Perhaps McAdams should just take a look (at the Archives). Why is this important? McAdams implies that the absence of such a left-sided fragment suggests that no bullet struck JFK from the front—and that, we all would agree, is indeed a central issue. I would emphasize however that, even though McAdams is clearly wrong about the existence of this fragment, its presence is indeed perplexing and that, by itself, raises some prickly and unorthodox questions. McAdams claims (p. 70) that Malcolm Perry, who performed the tracheotomy, and Charles Carrico were the only two physicians who saw the throat wound. Surely, however, McAdams is well aware of Perry’s own statement that he had left the wound “inviolate,” i.e., untouched and therefore still readily visible. In that case, Charles Crenshaw and Robert McClelland, as well as other physicians, could easily have witnessed this wound. Even Milton Helpern, the éminence grise of forensic pathologists, agreed that Perry’s incision should not have affected the visibility of the wound. In fact, physicians Baxter (6H42), McClelland (6H32), and Jones (6H54) offered specific descriptions of this wound, and so also did Drs. Akins and Jenkins. (The reference 6H54 is to WC ancillary volume 6, page 54.) However, the most interesting witness to the throat wound was pathologist J. Thornton Boswell himself. Although the pathologists had originally denied seeing a throat wound during the autopsy, Boswell later told Andy Purdy of the HSCA (August 17, 1977, p. 8) that he had in fact seen “part of the perimeter of a bullet wound in the anterior neck.” In fact, only three years after the assassination, Boswell had told The Baltimore Sun (Richard H. Levine, 25 November 1966, front page article) that, before the autopsy began, the pathologists had been apprised of JFK’s wounds and what had been done to him at Parkland. (Actually, multiple witnesses were aware of the throat wound at Bethesda; Kathy Cunningham, in particular, has summarized this data.) Is McAdams truly ignorant of these statements? In any case, he reveals none of this to his readers, thereby giving us another example of begging the question, i.e., he takes for granted a conclusion that first requires independent verification. Of course, his approach here serves his purpose well: after all, if only two Parkland physicians saw the wound (as McAdams wants to believe), these two could more easily be overruled by the official autopsy report (than if many Parkland doctors had seen and reported an apparent entrance wound—which is actually what they did report). McAdams cites a Bowman-Gray study (p. 226), which concluded that ER doctors misinterpreted single bullet wounds (i.e., confusing entrance with exit) 37% of the time. Even if ER personnel cannot reliably distinguish entry from exit wounds, though, that comment obfuscates the situation. To the contrary, in this particular case several facts trump those medical reports: (1) such a tiny exit wound could not be duplicated in WC experiments and (2) Milton Helpern (who had done 60,000 autopsies) said that he had never seen an exit wound that was so small (under similar conditions). Of course these (negative) WC experiments made specific assumptions: a certain (low) entry site on JFK’s head, an explicit distance and elevation for the shooter, a Carcano bullet, etc., which means that the relevance of their experiments could be debated. Rather suspiciously, during a WC Executive Session (December 18, 1963), John McCloy, Hale Boggs, and Gerald Ford actually discussed a possible frontal shot from the overpass. Of course, Paul Mandel in LIFE magazine, with his contortionist view of JFK, had also raised the possibility of a frontal throat shot (that strangely enough came from the rear): see here. A final, telling blow derives from the National Photographic Interpretation Center (NPIC): before political leverage was exerted, their first scenario actually included a throat shot at Z-190, many frames before Connally was struck, which was grossly inconsistent with the single bullet theory (SBT). See this data here. This NPIC study likely occurred after the LIFE article—after all, it quotes Mandel verbatim. These NPIC records were transferred from the CIA to the National Archives in 1993. They are located in flat #90A in the JFK Records Collection, along with the 4-panel briefing boards of the Zapruder film made by McMahon and Hunter. Here is yet one more problem (of many) with the SBT: so that the throat wound can remain (very) small, McAdams requires that the shirt and collar buttress the skin (p. 225). However, the eyewitness evidence is clear: the wound was above the shirt and tie. While before the WC, Charles Carrico (a surgeon, who saw the wound at Parkland) clearly implied that the wound was above the necktie and above the shirt collar (3H361-362). To leave no doubt about what Carrico had seen, Harold Weisberg reports his own confirmatory interview with Carrico (Post-Mortem 1969, pp. 357-358 and 375-376). Nurse Diana Bowron also reported seeing this wound while JFK was still in the limousine—before JFK was undressed (Killing the Truth by Harry Livingstone, p. 188)—but she could not have seen it unless it had been above the tie. Now think about this: if the wound indeed lay above the necktie, no buttressing would have been possible and McAdams’s case would then be at least suspect, if not lost. So McAdams has again hidden evidence from his reader and, as usual, this is evidence that seriously threatens his case. For more on the throat wound, see Milicent Cranor’s “Trajectory of a Lie” (as cited above). Ms. Cranor, after a thorough review of the ballistics literature, has offered an enlightening summary of relevant conclusions (see Appendix 6). 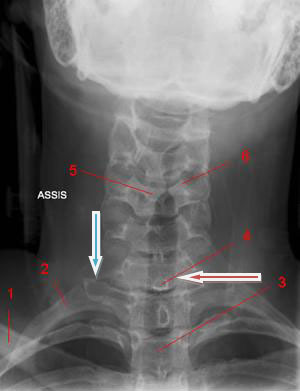 In the autopsy photograph (Appendix 5, Figure 2), the back wound appears to lie at about T1 (i.e., the first thoracic vertebra), just above the level of the scapular spine. This seriously disagrees with the T3 on the death certificate, which was prepared by Admiral Burkley (p. 221). Two individuals even placed it at T4: James Jenkins and, in a conversation with me, John Ebersole (who practiced my specialty of radiation oncology). For normal anatomy see Appendix 5, Figures 3A and 3B. As is well known, the back wound in the autopsy photo is noticeably higher than the holes in the shirt or jacket. Furthermore, the wound on the Autopsy Descriptive Sheet (prepared by Boswell at the autopsy; see Appendix 5, Figure 4) appears to lie well below T1—at least as low as T2, if not even lower. 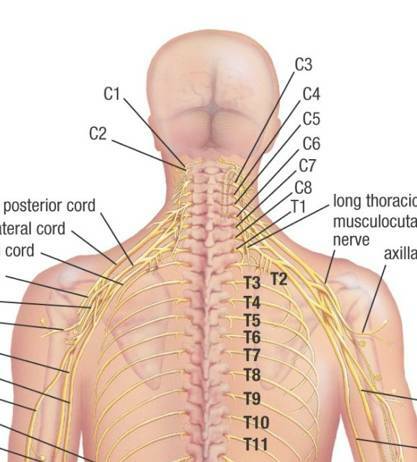 An online source assigns a typical level to the scapular spine as T3 (manualmed.blogspot.com/2008/09/thoracic-spine-landmarks.html). In fact, any level for this back wound below T1 would destroy the SBT (because the back wound would then be lower than the throat wound). However, Boswell later elevated this wound, thus abandoning his earlier, on-site observation. Somewhat amusingly, on this second occasion Boswell elevated this back wound far too high (compared to the autopsy photo), actually into the neck, which only raises questions about either his memory or his honesty. (See these two incompatible placements by Boswell at Inside the ARRB by Douglas Horne, Volume I, Figure 56.) A likely explanation for the discrepancy between the photo and the Descriptive Sheet is post-autopsy (illicit) photo alteration in the dark room. Curiously, this is the precise autopsy photo that displays an anomalous object on the back (not noted by prior investigations), which might be a leftover image from photographic tampering. Further discussion of this follows below. Another point is worth emphasizing: physical tests showed no copper deposits on the shirt or on the collar (in the front), even though they were present on the back of JFK’s jacket. This is consistent with a metal projectile as the source for the back wound, but it is inconsistent with a metal projectile through the front of the shirt. On the contrary, the slits had probably been created by the nurses’ scalpels. In an interview in 1971, Carrico actually confirmed this to Harold Weisberg—see Weisberg’s Subject Index File, under “Carrico,” items 02 and 03. (Jerry McKnight reports this.) In addition, based on my personal observations at the Archives, some cloth is missing from both the back of the shirt and the back of the jacket, but none appears missing from the slits at the collar. Furthermore, although McAdams claims that a throat wound at C7/T1 is feasible, he totally ignores the anatomic conundrums in the horizontal plane. (For pertinent, and rather devastating, anatomy and radiology images see Appendix 5, Figures 5-7.) For a more precise vertical level for the throat wound see MIDP (p. 228). James H. Fetzer has also offered a concise analysis of this evidence in “Reasoning about Assassinations,” which he presented at Cambridge and then published in an international, peer-reviewed journal (The International Journal of the Humanities (2005-2006), Volume 3, Issue 10, pp. 31-40). McAdams asks a pertinent question about the SBT: If a bullet struck the back, then where did this bullet go? He disregards a possible deflected fragment (from the street) that might have caused this wound. Such a bullet ricochet (possibly more than one) was reported by multiple eyewitnesses (6H238, 7H291, 7H507-515, MIDP, p. 36, and No More Silence by Larry Sneed, p. 145). Because this option—of a deflected projectile (not necessarily an entire bullet)—even appears in the WC ancillary volumes, McAdams has no excuse for omitting it. Of course, the same question might be asked about a frontal bullet to the throat: Where did it go? Again, McAdams has restricted the options, although he need not have done so. In MIDP (p. 258) I asked whether a glass fragment might have caused this wound. Such a fragment from the windshield (expelled by a frontal bullet) might fit this scenario. Moreover, its very narrow scattering cone (well documented in the ballistics literature) likely would have missed everyone else. Furthermore, the three tiny puncture wounds in JFK’s right cheek (reported by Tom Robinson during embalming) are also consistent with several additional, tiny scattered fragments from the front. (Given the typically short range of small particles, it is unlikely that they could have originated from the rear, as bone fragments for example, and then exited the cheek.) Of course, I don’t claim to know that a glass fragment is the explanation, but at least it should remain in this discussion. I know of no reason a priori to rule it out. To make matters even worse for McAdams, he himself quotes McClelland (p. 227): the president had “a fragment [emphasis added] wound of the trachea.” (This is actually McClelland’s handwritten note, as reproduced in the Warren Report (October 1964, p. 490).Therefore, by limiting the options for the throat wound, and for the back wound, McAdams has committed another logical fallacy—the false dichotomy. McAdams assumes that the location of these holes supports the SBT. While at the Archives I had a tall male wear the jacket (while standing). He was an inch or two taller than JFK. What was surprising was how low these holes lay. The bullet holes in the shirt and jacket were nearly at the same level (as one another); the center of the hole in the shirt lay 7 ½ centimeters inferior to the horizontal shoulder seam. It also lay about 3 centimeters inferior to the top of the scapula. The clothing images may be seen at here and here. McAdams cites a photographic study that shows the jacket elevated during the motorcade here. Although it is likely that the jacket was elevated at the critical moment, this study surprisingly does not estimate how much it was elevated. This study concludes: “As a direct result, the ‘low’ bullet holes in John Kennedy's shirt and jacket are not accurate indicators of the entry location, which must have been higher.” But this conclusion about the shirt cannot be certain—there is no photographic evidence of the shirt bunching up. In fact, Charles Carrico reported (3H359) that the back brace (“with stays and corset, in a corset-type arrangement and buckles”) extended upward nearly to the navel. This brace may therefore have kept the shirt from rising very much. The most important JFK wounds are those of the head, but McAdams discusses these only tangentially. This is a truly astonishing lack of emphasis. Despite a stunning disagreement with McAdams by most of the professional witnesses, he insists (p. 180) that the back of the head was intact. He also insists that the autopsy photographs and X-rays are authentic, but we now know otherwise (see further discussion below). Images of the back of the head (on the AP skull X-ray) show a bone flap, which probably could swing in and out, remarkably consistent with McClelland’s verbal description of it. I have identified this structure on images (MIDP, p. 227); when this flap was closed, the occipital hole was probably less obvious. I have also identified the skull defect left behind by the Harper fragment—an observation I initially noted with my (then-myopic) naked eyes, but then also confirmed via optical density data. But the real riddles of these wounds (and the X-rays, too) are totally ignored by McAdams. For example, among other inconsistencies, the three pathologists and one radiologist all placed the posterior skull entry wound about 10 centimeters inferior to the trail of metallic debris. (I refer here to the obvious collection of metallic like particles located high in the skull; many of these particles have fuzzy borders, an observation that raises the possibility of a mercury bullet—from the front.) Additional paradoxes are cited in my unanswered letter (see Appendix 8) to Max Holland, another writer who is cited approvingly by McAdams (p. vii). Others corroborate this location, such as Seth Kantor (20H353), a Scripps-Howard reporter whose notes stated: “intered (sic) right temple.” Charles Crenshaw, M.D., one of the treating physicians in Trauma Room One, demonstrated this on live television for Geraldo Rivera (“Now It Can Be Told,” 2 April 1992). I still have this video in my personal library; Crenshaw shows just where this shot entered—near the hairline, just above the lateral border of the right eye socket. Tom Robinson, the embalmer who restored JFK’s head, described a wound, about 1/4 inch across, above the right eye near the hairline, where he had to place wax to disguise it (HSCA interview of January 12, 1977). He added that this wound was so close to the hairline that the hair could easily cover it, which may explain why more witnesses did not see it. Dennis David also saw photographs with a bullet entry high in the right forehead. These were shown to him by William Pitzer (In the Eye of History by William Law, p. 23). Despite the right forehead laceration seen in the autopsy photo, the Parkland witnesses denied seeing any damage to JFK’s face. However, at Bethesda, Ed Reed (for the ARRB) recalled that Humes had made an incision in the forehead. Reed even recalls Humes sawing into the forehead bone and Robinson likewise recalls some sawing; furthermore, these events occurred quite early that evening. The skull X-rays themselves are quite consistent with such a right temple entry. The small metallic particles in these X-rays appear to align with just such an entry site. Even more intriguing, this extrapolated line seems to pass through a notch in the skull (the right forehead) that I noticed on the X-rays (for my sketch, see Killing Kennedy by Harrison Livingstone, p. 102). Furthermore, Boswell also sketched missing bone at precisely this site (when he drew on a skull model for the ARRB). There is one last tantalizing clue: the largest metal fragment should have the greatest range—and so it does. The lateral skull X-ray clearly shows that the largest authentic metal fragment (not the small one correlated with the 6.5 mm object within JFK’s right orbit on the AP X-ray) lies near the back of the head—which is consistent with a frontal shot. Moreover, with these acoustics data we begin to unmask the profound biases of Professor McAdams. Although he acknowledges the debunking contributions of some pro-conspiracy researchers (p. 193), he curiously ignores another one—my own highly itemized (and definitely negative) review of the acoustics data. One of the blurb writers for McAdams’s book has noted that I am the only pro-conspiracy researcher who has publicly distanced himself from these acoustics data. Given the admiration of McAdams for his coterie of “debunking conspiracists,” my acoustics review might well have caught his (favorable) eye. Curiously, my favorable review of Dale Myers on this matter also escaped McAdams’s notice. McAdams should have enjoyed my negative conclusion about the acoustic data; for this he might at least have awarded me “honorable mention” in his coterie’s hall of fame. (Myers, of course, was given first class honors by McAdams for his computer reconstruction, despite the fact that Cranor, Jim DiEugenio, and I, among others, have skewered that entire project.) That the Mantik name does not even appear in the book’s index only provokes some probing questions about the mindset of our ersatz instructor in logic. Paradoxically, some of his cited articles do recognize me. “Focusing on the most reliable evidence violates the collector’s instinct of conspiracy theorists. They collect evidence assiduously, and whoever has the biggest collection is the best researcher—just as the best stamp collector is one who has the largest number and the rarest stamps” (p. 157). As stamp collector I strongly object, on multiple levels, to this characterization. First, I have done precisely what McAdams has advised (p. x), i.e., “focus on the hard data.” I have repeatedly examined the autopsy materials at the National Archives (online: “20 conclusions after 9 visits”), yet McAdams has unfailingly ignored this data. Even more damning though, these data from the Archives are not theoretical (no conspiracy theorist here); rather, they are observational and experimental (perhaps I am a “conspiracy experimentalist”), replete with hundreds of measurements. Furthermore, these data can in principle be reproduced by anyone with access to the autopsy X-rays. (I have seen an optical densitometer at the Archives, which they might loan to McAdams; even a nonscientist can quickly learn to use it—with minimal instruction.) The use of optical density measurements in radiology is an old science (for this history see Appendix 10) and data acquisition itself is rather trivial. After calibrating the device (a simple matter—which I often did during my work), the X-ray is positioned and a reading is taken. For the 6.5 mm object within JFK’s right orbit (on the AP X-ray) I have done this many, many times, typically in the presence of multiple witnesses: an ophthalmologist, an astronomer (who employs optical density measurements in his specialty), and multiple staff members from the Archives. These simple data are astounding: the apparent metallic length of this 6.5 mm object (from front to back), implied by even a single measurement, is radically inconsistent with reality (it is far too long). At this juncture, Sherlock Holmes, from my favorite childhood tale (The Sign of the Four)is precisely on target: “Eliminate all other factors, and the one which remains must be the truth.” In this case the conclusion is unambiguous: this 6.5 mm object must have been superimposed in the darkroom and must therefore be a forgery (Assassination Science, edited by James Fetzer, pp. 120-137). Even Larry Sturdivan, the ballistics expert who testified before the WC (and who is even cited by McAdams, p. 130) could not explain this object. I’m not sure just what that 6.5 mm fragment is. One thing I’m sure it is NOT is a cross-section from the interior of a bullet. I have seen literally thousands of bullets, deformed and undeformed, after penetrating tissue and tissue simulants. Some were bent, some torn in two or more pieces, but to have a cross-section sheared out is physically impossible. That fragment has a lot of mystery associated with it. Some have said it was a piece of the jacket, sheared off by the bone and left on the outside of the skull. I’ve never seen a perfectly round piece of bullet jacket in any wound. Furthermore, the fragment seems to have greater optical density thin-face on [the frontal X-ray] than it does edgewise [the lateral X-ray]…. The only thing I can think is that it is an artifact (MIDP, p. 266). Of course, Sturdivan’s conclusion is just more vital evidence that McAdams has decided to cull; even worse, though, he does not so inform his readers. To date, no one (unless forgery is invoked) has been able to explain this bizarre 6.5 mm object on JFK’s AP X-ray. Even the experts for the ARRB (including the forensic radiologist, John J. Fitzpatrick, who was visibly troubled by this strange feature) could not explain this fantastic object). So we are left with this conclusion about this hardest of “hard” evidence: an odd event occurred in JFK’s X-rays that has never, before or since, been seen in the history of radiology. Furthermore, even the best experts in forensic radiology still cannot explain it. And this is what McAdams—who has never claimed to be an expert on X-rays—takes for “hard” evidence of no conspiracy. (Since Speer’s essays overlap with these issues, readers might also review my response to Pat’s protests at here.) Also recall that Helpern, in over 60,000 cases, had never seen an exit bullet produce a wound like that in JFK’s throat. That might raise an acutely troubling question about the lone gunman scenario: How likely is it that two such unprecedented events would spontaneously appear in just one case? McAdams asks whether the photos and X-rays had changed in the interval between the autopsy and the Clark Panel (1968). He has an excellent reason for asking this question: the perplexing 6.5 mm object within JFK’s right orbit had not been reported at the autopsy, even though the chief goal of the X-rays had been to identify precisely such objects. Moreover, McAdams never asks the most embarrassing question: Of the many individuals who saw the X-rays that night, why did no one discuss, report, or recall this bizarre object? To make matters even worse for this “hard” evidence, I made one more critical observation on a lateral JFK skull X-ray at the Archives, an observation that any amateur could easily reproduce (including several anti-conspiracists who have since visited, yet apparently failed to look): this left lateral is obviously a copy, not an original. Why does that matter? First, the Archives claim that it is an original, so something is clearly amiss. Secondly, though, if it is a copy, the door would be left wide open to manipulation in the dark room. And how do I know it is a copy? Because a T-shaped inscription was made on the original film by someone (for an unknown reason, but it doesn’t matter); this could only have been done by scraping the emulsion off the film, a fact that would be trivial to see on an original. But here is the problem: the film at the Archives has no missing emulsion! In fact all surfaces (near this inscription) show entirely intact emulsion—which, of course, perfectly describes a duplicate X-ray film. Of course, McAdams has also culled this observation from his data set. He could easily have tested this observation himself—even now, why doesn’t he just book a trip to the Archives? The autopsy photographs constitute more “hard” evidence that McAdams likes to cite, but all is not kosher here either. Despite what the HSCA reported, stereo viewing in one particular photographic pair (of the back of the head) does not yield a 3D image. As the HSCA concluded, however, all other such pairs do indeed yield a 3D image (as I also observed via the stereo viewer). I would emphasize though that the HSCA never actually viewed a control photo in which such a hairpiece had actually been photographically inserted. Therefore, when they finally saw such a photo in the autopsy collection, it was not surprising that they failed to recognize it as fraudulent. In fact, precisely where the hair is suspect, the image is 2D, just what would be expected if an identical replacement hairpiece had been inserted (in the darkroom) into both members of a matched pair of photos. I made this observation (consistently) on multiple pairs: the transparencies, the colored prints, and the black and white pair. This paradox remained unchanged no matter how I positioned or rotated each member of the pair. But there is yet more trouble: a matched stereo pair of 5x7 transparencies (of JFK’s back) displays a different object (on the left back) for each transparency. On one, a small dark spot is visible (possibly clotted blood, although the actual cause is irrelevant for this discussion), but on the second transparency (at the same site on the back), this dark spot has been transformed into a much lighter spot, with a horizontal dark line through it! Furthermore, each of the two matched color prints (of this same perspective) shows only the dark spot. (I know that these prints are a matched pair because they yield a 3D image of the back via the stereo viewer.) So now the questions become obvious: How can two transparencies, supposedly taken just seconds apart at the autopsy, be that different? And how can these two color prints (each showing a dark spot) derive, as they must, from two different transparencies (i.e., only one of these transparencies shows the dark spot)? This is impossible, and that by itself raises troubling questions about the authenticity of at least one transparency (especially the one with the lighter spot and horizontal line). We can put this paradox in another way: one of the color prints must be an orphan, i.e., both color prints display the dark spot, but only one transparency displays this spot, so where is the transparency that gave rise to the second color print? (The transparencies are claimed to be the actual photos exposed by the autopsy photographer, while the prints, on the other hand, were supposedly copied from the transparencies.) These anomalous observations are profoundly troubling: they inescapably open the door to alteration in the darkroom. Even more suspiciously, this photo (of the back) just happens also to include the bizarre hairpiece. McAdams has never viewed these autopsy materials himself—as usual, he just quotes the impressions of others. Why doesn’t he finally take a look himself (and remember to bring along a stereo viewer)? After all, personal observation beats trading on the reports of others, but it does take a little effort. Quite strikingly, the photo experts agreed with Robert Groden that an area at the back of JFK's head looked abnormally dark, but they said that the hair (curiously in just this limited area) must have been washed before the photos were taken (presumably in order to make the wound more visible). Although they said this area looked wet, no one at the autopsy recalled such washing; in fact, everyone who was asked denied such cleaning. (See The Boston Globe, June 21, 1981.) Finally, this “wet” area is precisely the same site that looked suspicious to me during my stereo viewing. What is the likelihood of that occurring by chance alone? Identifying criminals by their fingerprints had been introduced in the 1860s by Sir William James Herschel in India. Francis Galton (with an IQ of 200 and a half-cousin to Charles Darwin) identified specific types of fingerprint patterns. He described and classified them into eight broad categories and his work led to their use in the courtroom. Galton also invented a pocket counting device used to record attractive women in Great Britain, which allowed him to create the first “beauty map” of the land. Although he also invented the term “eugenics,” he appears not to have suggested selecting for gorgeous offspring. It would seem that a majority of our FP experts agree that fingerprint identification properly carried out & verified is an absolute fact, not an opinion. (“FP Identification—Opinion or Fact,” circulated by Euan Innes, Head of the Scottish Fingerprint Service. Another important reason for the increased scrutiny of fingerprint evidence is the increasing number of documented misidentifications based on fingerprint analysis. Such misidentifications are of interest for several reasons: they illustrate the subjective nature of fingerprint evidence; they directly contradict a number of claims advanced by the fingerprint profession; and they provide concrete illustrations of just what can go wrong. Another case which clearly exemplifies this 'different opinions' position is the appeal case against Gilbert McNamee (The Hyde Park Bombing). In brief, FP marks were found on a Duracell battery which was removed from an explosive device. McNamee was convicted and appealed but was turned down. After serving 12 years in prison McNamee’s case was raised and heard by the Criminal Review Commission. At the end of November 1998, 13 different experts including Heads and Deputy heads of bureaux in England, Senior fingerprint experts and Independent experts gave opinions at the Royal Court of Justice in London as to their findings. Opinions ranged from "not identical", "identical" and "insufficient." Opinions also ranged as to whether the mark had any movement in it. McNamee’s appeal was successful. Perhaps Oswald had handled the Mannlicher gun barrel (when disassembled) at some earlier date—based on Carl Day’s observation of the print under the wooden stock, and his statement that this print was dry (and therefore old). But the fingerprint evidence (from the trigger guard) that Oswald had handled the rifle on or about November 22 is not conclusive. McAdams lists his “killer evidence” (p. 2) as fingerprints, handwriting, ballistics, and photographs (notice that he omits neutron activation analysis). With fingerprint evidence now under the gun, an independent look at the ballistics evidence might also be wise. For example, Howard Donahue (a court-certified firearms expert and a world-class marksman), after viewing one of the limousine fragments (at the Archives), was quite puzzled by how severely its jacket had been peeled back, which was hardly consistent with its striking JFK’s head. On the contrary, he thought it much more likely that concrete (i.e., a ricochet from the street) caused this near-magical bending (Mortal Error by Bonar Menninger, p. 75). We can only wonder: With the “linch pin” permanently missing in action and now fingerprint evidence also severely threatened, can we expect any WC loyalists to reconsider their positions—or does “hard” evidence not matter after all? In the past, the fingerprint community has defended its lack of scientific grounding, in part, by appealing to its track record in the courts. The importance of Cowansand Mayfield, among other things, is that they underscore the shakiness of such an argument. Obtaining a conviction does not validate the identification [emphasis added]. A rigorous system of mandatory, frequent, external blind proficiency testing needs to be implemented. Second, a mechanism for routine, random, blind audits of latent identifications should be established. Third, the government needs to fund research into the validity and reliability of fingerprint identification, the development of pattern recognition software, and the quantification of the uncertainty inherent in latent print identifications. …we’re able for the first time to actually say that these are definitely the fingerprints of Lee Harvey Oswald and that they are on the rifle. There is no doubt about it (McAdams, p. 161, note 27). This is what McAdams calls “killer evidence” (pp. 2 and 161). Unfortunately, though, Scalese’s report came about a decade (or more) before the many strictly opposite quotations above. Despite his obeisance to fingerprints, McAdams seems blissfully unaware of the recent revolution in the scientific use of this evidence. I was seriously disappointed by this book, not merely because I disagreed with it on so many fundamental issues, but even more so because it fell so far short of its announced goals (of explaining and promoting critical thinking). I was also disenchanted that it so often merely regurgitated second hand data; McAdams appears to have done little research of his own—and none at all at the National Archives and apparently none at the Sixth Floor Museum. Chiefly, however, I was astonished by the central issues that he frequently overlooked. Moreover, not every one of his oversights is easily explained by random chance, and that inevitably raises the ugly specter of evidence suppression. After all, if some of these omissions were deliberate, that is radically different from merely overlooking critical problems. Of course, the book is rather short, and space was limited, but many of these neglected issues (such as those I cite here, even in this limited review) could have been incorporated, had McAdams merely been willing to dispense with his incessant and peripatetic comments, e.g., 9/11, UFOs, moon landings, unrelated conspiracies, bureaucrats, Obama’s birth certificate, and especially his interminable thrashing of inconsequential witnesses. (After all, the book’s title is JFK Assassination Logic.) He might also have called off his attacks on feeble-minded conspiracy believers in favor of a few more fundamental issues, but that would, of course, have necessitated more critical thinking. Although McAdams persistently rants about the critical role of hard evidence, we might ask a simple question: Does he follow his own advice? Obviously not. In fact, aside from Chapter 15 (the SBT), only about one in every nine pages qualifies for that mark of respect. McAdams even agrees with me that the “best” evidence includes the medical evidence (p. 179). So how many pages does McAdams devote to this?—aside from Chapter 15, only about 10 pages (in a book of 254 pages). Although it was a ground-breaking book for its time, citing Six Seconds in Dallas as still “the best conspiracy book” seems self-serving. Does McAdams somberly believe that no significant books have been published in the 44 years since 1967? If so, that would totally account for—without comment or discussion—most of the points that had to be raised in this review. Of course, such an attitude by McAdams just creates another straw man, i.e., he suggests that a far older (and therefore necessarily more incomplete) conspiracy book presents a stronger case than that presented by more recent conspiracy-oriented books. In summary, we don’t need more books like this. We have recently been gifted with two books packed full of sundry details—by Bugliosi and by Horne—but both strangely ignored by McAdams. We don’t need any more short survey books either (Stewart Galanor has already bestowed on us his brilliant Cover-Up). What we do need now are researchers dedicated to specific issues (McAdams does cite several examples), but above all we need authors with open minds. That would indeed be novel, but these two traits do not feature strongly in this book. McAdams might instead go back to doing whatever he does best—with elections on the horizon, perhaps voter behavior might give him pleasure. He might also benefit from a course in logic—after all, as we have repeatedly seen, critical thinking about JFK is clearly not his strong suit (see Appendix 11). Marshall et al. showed a two-minute, homemade, color movie film with sound to 151 “witnesses.” Within minutes of their viewing they gave a “free report,” during which the interrogator said almost nothing. In individual interviews held in private rooms they were asked to be as accurate and complete as possible, with the understanding that the interviewer had not seen the movie. After this, they were examined using one of four types of questions: (1) open-ended with moderate guidance, (2) open-ended with high guidance, (3) structured, multiple choice questions, and (4) structured leading questions. In addition, half of the witnesses encountered a supportive atmosphere whereas the other half met a hostile atmosphere. To assess salience of specific items, a second group (high school students and members of the survey staff) were asked to recall as many as possible of the 900 items in the movie; if more than 50% of these viewers reported a particular item it was labeled highly salient. The conclusions of this study are as follows. The first surprise was that the experimental atmosphere, whether hostile or supportive, had no important effect on either the accuracy or completeness of the testimony. In the free report format, the accuracy of the witnesses was never less than 95% for any degree of salience, and it was 99% for highly salient items. And for these items, it made little difference how the questions were asked: the accuracy ranged from 96 to 99%. The free report format yielded the lowest completeness—70% for highly salient items. For these items, higher levels of completeness were found for moderate guidance (84%), high guidance (88%), multiple choice (98%), and leading (98%) questions. The greater the salience, the less was the effect of different types of interrogation on accuracy. Also, as salience increased there was only a small increase in completeness. The authors note that the trade-off between accuracy and completeness was much less than expected; in fact, coverage could increase a great deal while accuracy declined only slightly. The nonviolent version of the target advertisement was less well remembered when placed in the violent film than in the nonviolent film, supporting Bushman and Bonacci (2002). In contrast, the violent version of the target advertisement was remembered much better than the nonviolent version when placed in the violent film sequence. Participants’ hostility scores were higher only after watching the violent film, and associated with an impairment in the memory of the nonviolent advertisements, while enhancing the memory of the violent advertisement, thus providing some support for Bushman’s (1998a) hostile-thought hypothesis. Many lines of evidence suggest that major secrets can be kept for long intervals of time. This is not only possible, but for bureaucracies, is surprisingly common (Voltaire’s Bastards by John Ralston Paul; see Chapter 12, “The Art of the Secret,” especially p. 289). Gary L. Aguilar, M.D., has reminded us that Daniel Ellsberg, who released the Pentagon Papers, recalls that in 1964 at least 100 people knew the same information that he disclosed in 1971, yet no one said anything about it before he did. See this article of May 27, 1997: “Ellsberg Remembers,” The Nation (p. 7). On the morning that the first nuclear bomb was exploded in the New Mexico desert in 1945, Mrs. Leslie Groves received a telephone call. The caller suggested that she listen to the radio during the day since one of her family members would be in the news. Not knowing what to expect, and not even knowing which family member was meant, she was shocked to learn that her husband, General Leslie Groves, had been the military director of the Manhattan Project. Many others at Los Alamos, to say nothing of family and friends, honored this same state of secrecy. Neither the public nor the media knew any significant details of this project during the several years that it continued, or if they did know, they also kept the secret. Secretary of Energy Hazel O’Leary tried (irresponsibly) to take credit for exposing the (unethical, by today’s standards) radiation experiments that began in the 1940s. However, it was only through the persistent and courageous work of Eileen Welsome (The Plutonium Files 1999) that the public finally learned about these escapades. My files contain numerous examples of medical misbehavior over several decades—about which no one ever said anything for many years. Without Welsome we may never have learned about the radiation experiments either. Furthermore, these experiments were performed at blue ribbon universities and institutions. In each of these cases the secret was kept for many years, and often kept by many. Figure 1. AP Autopsy X-ray of JFK’s skull. Note the semi-lunar (6.5 mm) object inside JFK’s right orbit (vertical green arrow). 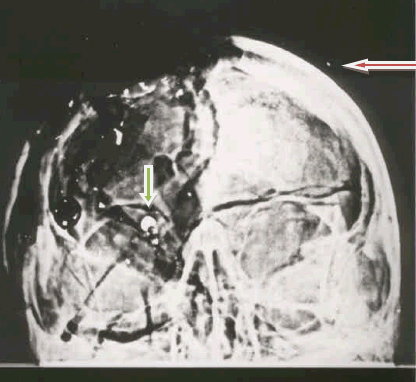 The metal fragment overlying the left skull is identified by the horizontal red arrow. When questioned by the WC, James Humes (the pathologist) stated (2H100) that the largest metal fragment removed from JFK’s skull was “Flat, irregular, two or three millimeters.” Surely this does not describe the 6.5 mm object seen here. Before the ARRB, Humes was again asked whether the metal fragments he had removed were larger or smaller than this 6.5 mm object. He replied (MIDP, p. 449), “Smaller. Smaller; considerably smaller….I don’t recall retrieving anything of this size.” The other two pathologists also did not recall this object. Figure 2. Autopsy photograph of JFK’s back. The wound (arrow) appears to be at about T1. The scapular spine is faintly visible. Figure 3A. The horizontal scapular spine can be faintly seen (red arrow), inferior to the level of T1. The scapular spine appears to lie at about the level of T2 or T3, close to Boswell’s level for the back wound on his Autopsy Descriptive Sheet. 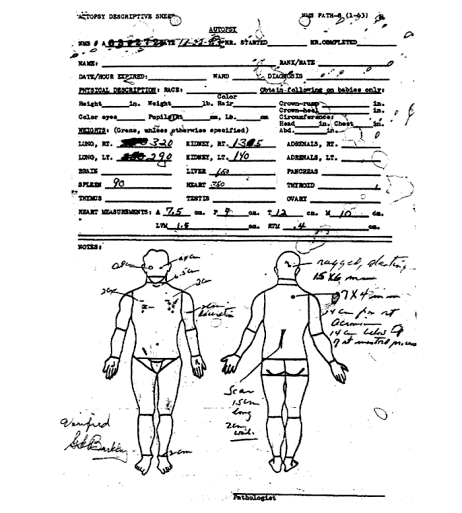 In other words, the autopsy photo and Boswell’s Sheet are inconsistent. Far worse, though, Boswell later elevated this wound into the neck, much higher than shown in the autopsy photograph. Any level inferior to T1 for the back wound makes the SBT impossible. Figure 4. The Autopsy Descriptive Sheet, prepared by Boswell. Note the level of the back wound (indicated by the horizontal line from “7 x 4 mm”). It appears to lie at least as low as T2, possibly even lower. If accurate, that would immediately invalidate the SBT. Figure 5. Skeleton as viewed from the front. 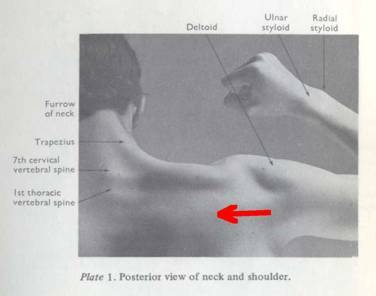 McAdams claims (p. 223) that the bullet (of the SBT) traversed JFK at C7/T1 (between the levels of the seventh cervical and the first thoracic vertebrae)—at about the tip of the vertical cyan arrow. 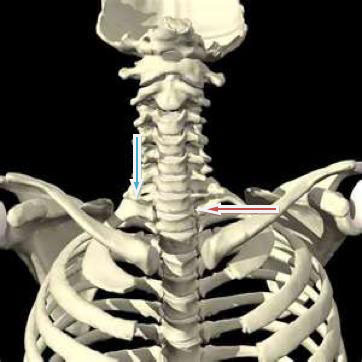 The horizontal red arrow identifies the C7 vertebra. As seen here, it is impossible for a bullet to pass between the transverse process of C7 and the medial portion of the first rib (cyan arrow), without damaging bone. Also note how close together (actually overlapping) these transverse processes are for all of the cervical vertebrae. Therefore, no bullet could have traversed JFK at any cervical level and still be consistent with the autopsy photograph (without causing obvious bone destruction). On the other hand, a bullet inferior to T1 would likely have perforated the right lung apex, which was not seen at the autopsy. Only a contusion was seen there. Figure 6. Cervical Spine X-ray: AP view. 1, Clavicle. 2, 1st rib (from T1). 3, Trachea. 4, Spinous process of C7. 5, Vertebral Body of C5. 6, Uncinate process. A bullet could not pass at the site implied by McAdams (tip of the vertical cyan arrow), which lies between the level of the C7 vertebral body (horizontal red arrow) and the level of T1, without causing obvious bone destruction. That was not seen in JFK. Figure 7. CT scan of a patient. This cross section is very close to C7-T1, the level chosen by McAdams for the SBT. I used JFK’s wound measurements to place the hypothetical trajectory (in red). Such a trajectory is impossible here because bone from the spine (the transverse process) intervenes. Based on his X-rays, JFK experienced no such bone trauma. In 1963, CT scans were still in the distant future. This visual disproof of the single bullet theory was first anticipated several years after the assassination (but still well before CT scanners) by a pathologist, John Nichols, MD, PhD. Entrance wounds can be jagged. A few JFK witnesses said that the throat wound was somewhat jagged; these comments have been used by WC loyalists to conclude that the throat wound was an exit. Entrance wounds need not have abrasion collars. Some of the Parkland doctors indicated that JFK’s throat wound had an abrasion collar, which would suggest an entrance wound. However, its absence would prove nothing. 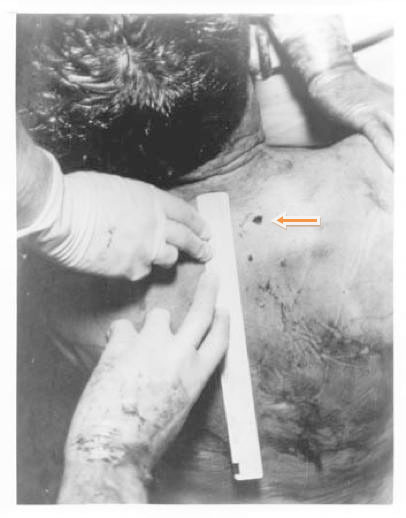 Shored (buttressed) exit wounds do have abrasion collars; in fact, these are typically large (not the case for JFK). The abrasion collar is formed when the bullet crushes the skin against a rigid object that “shores” the skin, i.e., the skin is fixed in place as the bullet exits. And, because the skin is kept in place and is not stretched outward while the bullet advances, the wound size matches the bullet size (like a cookie cutter). Most entrance wounds are shored by muscle or bone and are therefore small. JFK’s small throat wound is sometimes attributed (by WC loyalists) to shoring by the collar and necktie. But in every case of a shored wound, there is a pronounced abrasion collar, with bits of skin pulled outward as the neck and shirt eventually separate. Therefore, skin is left behind on the material (in this case, the shirt). The FBI examined the inside of JFK’s shirt, but they found not even a scrap of skin. Exit wounds can be small, as proved by well-controlled experiments and wartime experience. A typical (unshored) exit wound is large. In this case, the bullet stretches the skin outward, causing tenting and then tearing of the skin as it exits, and it leaves behind a star-shaped wound. Loose clothing can permit enough stretching that the bullet can exit before it encounters cloth. In specific cases though unshored exit wounds can be even smaller than the entrance wounds from the same bullet. This is more likely when the exit speed is low. In particular, a bullet fired from a great distance may lose much of its energy, and thereby create a small exit wound. When police cannot decide between an entrance versus an exit wound (e.g., when the context is controversial), pathologists are asked to analyze the wound under the microscope. For instance, just as the beveling of the skull can often determine entrance versus exit, so also can the beveling of bullet wounds in skin, i.e., dermis and epidermis are affected similarly to the skull tables. The following is a quotation from Doug Weldon at (http://educationforum.ipbhost.com/index.php?showtopic=15484). From the new medical depositions taken by the Assassination Records Review Board (ARRB), we now know that the only recognized autopsy photographer, John Stringer, did not take the autopsy photographs of the brain. A memorandum issued by the ARRB strongly suggests that two different brains were autopsied and that the brain photographs in the National Archives most likely are not those of JFK. My personal, detailed studies of the autopsy skull X-rays, including an original use of optical densitometry, show virtually no brain tissue in a fist-sized area at the front of the skull, just where the photographs (paradoxically) show nearly intact brain. My measurements are not only consistent with the conclusions of the ARRB, but actually anticipated them by several years. The shot (or shots) to the head pose even worse conundrums for Holland. If he agrees with the pathologists that JFK was struck low on the right rear of the skull, he then has no explanation for the obvious trail of metallic debris that lies more than 4 inches higher. Alternately, if he concludes that a bullet entered much higher, he must then believe that all three qualified pathologists were wrong by 4 inches, and that an absurdly unique event occurred in the history of ballistics—namely that an internal 6.5 mm cross section of a bullet was sliced out and then migrated 1 cm lower and stayed there. In addition, and after all this, he must also believe that the trail of metallic debris still lies well above his proposed entry site. No ballistics expert has ever testified to seeing so much nonsense from one bullet. Even worse for Holland, just within the past year, Larry Sturdivan, the ballistics expert for the 1977–78 Congressional investigation, has insisted that this 6.5 mm cross section cannot represent a metallic fragment at all—thus crippling the central basis for the conclusions reached in prior official inquiries. My own research on the X-rays over the past 5 years (performed at the National Archives and now published in Assassination Science, edited by James Fetzer) agrees with Sturdivan that this object cannot represent a real piece of metal. [Only a tiny metal fragment is visible at the corresponding site on the lateral X-ray.] I have, in addition, shown how simple it was in that era deliberately to manufacture (in the darkroom) an altered X-ray with a 6.5 mm metallic image added to it (so that Oswald’s rifle would be incriminated). Finally, at my request the ARRB specifically asked each of the autopsy pathologists under oath if they recalled seeing this flagrantly obvious, 6.5 mm object on the X-rays during the autopsy. Just as I had predicted, none of them could recall this artifact—one that my 7-year-old (nonradiologist) son instantly spotted on the extant anterior skull X-ray. [This has been slightly adapted from my article in MIDP, p. 400]. The following is extracted from my review of Hear No Evil by Donald Thomas at here. The task now was to find matches, if any, between the 432 test shot patterns and the six evidence patterns. Such matches would presumably determine both the shooter locations and the target sites. For this exercise, the reader must imagine a very large matrix, consisting of 432 entries vertically and six entries horizontally. For each element of this matrix there is an evidence pattern and a test pattern, which are to be compared to one another. So a total of 432 x 6 = 2592 comparisons must be made. Matches for a specific shot were decided based solely on the time between spikes, i.e., amplitude was ignored (except, of course, for the already completed, initial selection of suspect gunshots). A deviation of eight milliseconds (msec) was permitted, since the microphones might not precisely match the motorcycle position. Even air movement might change the matches. n = number of spikes in the test pattern. For a perfect match, r = 1, while r = 0 means no match. But, partly because of so much noise, a perfect match could not be expected. Results of interest were for r > 0.6; however, it should be emphasized that this is an arbitrary value. Some other value could have been chosen, with a likely different final outcome, possibly even wildly different. Values for r < 0.5 were ignored; that left only 15 possible matches (see Table 13 by Thomas). These 15 had the generic pattern of gunshot echoes in Dealey Plaza. The reader must understand that this does not mean 15 shots! After all, duplicate test shots had been fired from the TSBD (inside and outside the window). Furthermore, matches sometimes occurred at adjacent microphones—from the same shot—as might well be expected if the motorcycle had been between two adjacent microphones. Only four actual shots were proposed. Because no one recalls the history of this science (of optical density), a short review is appropriate. This history was summarized in a November 1989 article from the Eastman Kodak Laboratory, co-authored by Arthur Haus and John Cullinan—“Screen Film Processing Systems for Medical Radiography: A Historical Review,” Radiographics, Volume 9, p. 1203. The article can also be found online at http://radiographics.rsna.org/content/9/6/1203.full.pdf. After I had completed my original article on the JFK X-rays, I sent a copy to Arthur Haus (the above author). After reviewing it he offered no criticisms of it. I had had a prior conference telephone call with him and his colleague about X-ray films of the 1960s. This information had played a major role in my detective work on the JFK autopsy X-rays and was included in my paper. I later met Haus in person at my specialty meetings in Los Angeles. When I measured the optical density of the 6.5 mm artifact within JFK’s right orbit (at the Archives), I had invoked the same principles—the optical density was related to the amount of tissue traversed by the X-rays (that had struck a specific point on the film). Of course, if JFK’s X-rays had been double exposed in the darkroom precisely over this 6.5 mm object (as I have proposed—and whose feasibility I have even demonstrated), then this data would make no sense. Such nonsense, of course, is exactly what the data showed. And, consistent with this, no professional has ever been able to make sense of this 6.5 mm object either. It remains unique in the history of radiology. In any case, my major point here is simple and straightforward: no one should claim that optical density measurements are too novel to be used in analyzing X-ray films. The only parameter that is new here is its application to a president of the United States—the principles are the same. B. Eyewitnesses, even physicians doing what they usually do, cannot be trusted. Furthermore, no distinction need be made between earlier and later recollections of eyewitnesses. C. Photos are to be trusted over eyewitnesses, even when no one recognizes the photos. D. The size of Connally’s back wound after surgery is more relevant than its original size. E Only two physicians at Parkland saw JFK’s throat wound. F. Because false sightings in general are unreliable, two Oswalds are not possible. G. Major secrets cannot be kept. H. The acoustic evidence contained 15 matches. I. There is nothing noteworthy about the 6.5 mm object within JFK’s right orbit on the AP X-ray. J. On JFK’s skull X-rays, no metal fragment is seen on JFK’s left side. K. Fingerprint evidence is “killer” evidence. David W. Mantik, MD, Ph.D., is a board certified radiation oncologist who previously served on the tenure-track physics faculty at U. Michigan. He received his PhD in physics from U. Wisconsin, his MD from Michigan, completed a post-doctoral fellowship at Stanford, and held a Junior Faculty Clinical Fellowship at USC. He has visited the National Archives on nine separate occasions and has written extensively about the JFK medical evidence, particularly the autopsy images. He has recently published an e-book, JFK’s Head Wounds.